I always dreamt of this crazy vacation where I would roam about like a wanderer, away from the hassles of daily life, internet, office. I wanted to plan it with my besties, but thanks to their busy schedule and unavailability that the National Himalayan Expedition Chanderkhani Pass happened to me. I reached the YHAI website via some travel blog and booked myself solo for the 10th May 2015 Reporting. 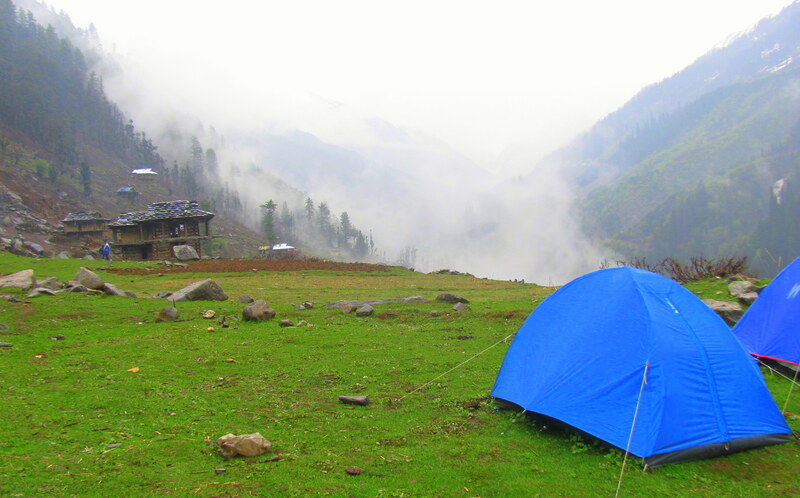 This was a 10 days, Kullu based Camp, my first trek ever and that too the Himalayas. Since I had two months to go, I did pretty good amount of research. ALERT! 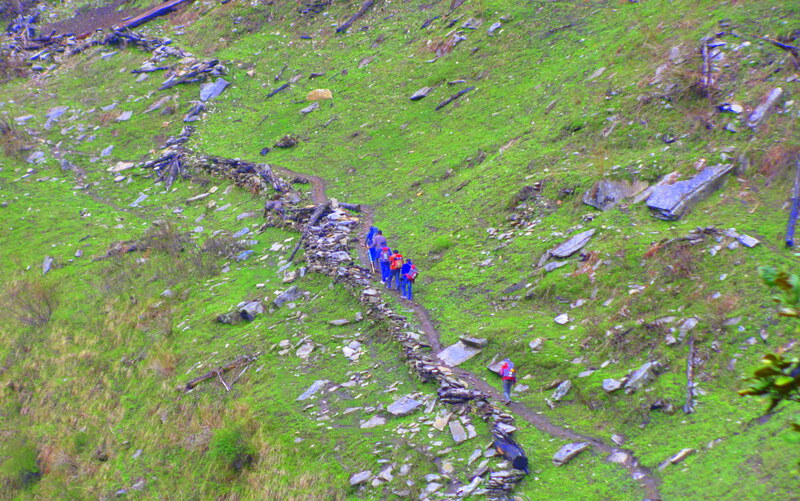 Trekking in the Himalayas is not fun, there’s a lot more which comes along in the package. Don’t do this, as further in my post you get to know why. Do good research, ensure your fitness (both mentally & physically) and then choose which trek suits you best. 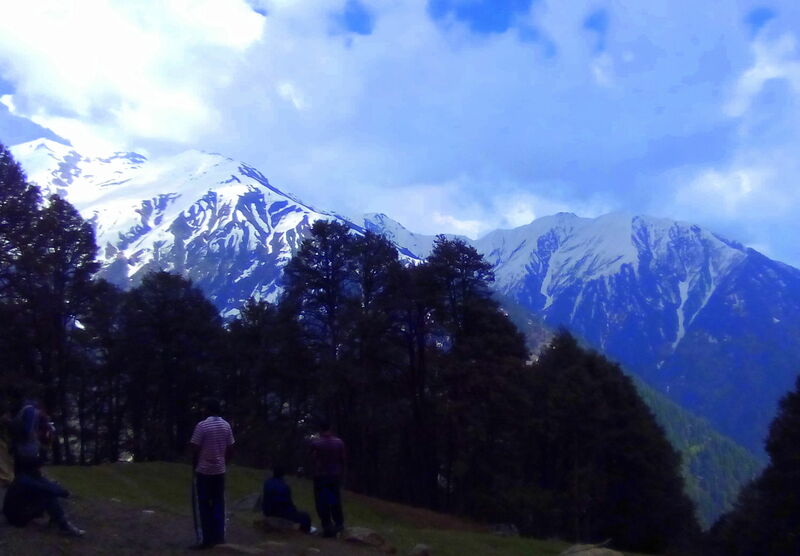 Himalayas are always unpredictable, and the weather may turn around things for you. I did prepare my checklist long way from all that I could research but have updated it after my trip from my experience. My parents were a bit relaxed now but hang on; something worse was yet to come. The disastrous 25th April Nepal Earthquake which did huge tragedy to this beautiful Himalayan nation, also had some impact on many states of India including the northern India, Bihar, West Bengal, Delhi, Gujarat etc. This happened just 12 days before I was leaving for Himachal, but I remained adamant, I was going for sure. 5th May 2015: Vadodara to Chandigarh (via Paschim Express): Finally the day arrived when I packed off to my most awaited trip ever. I was working this day and left office at 3:00 PM as our train was scheduled at 5:30 PM from Vadodara. I was the first to do my backpack out of the 6 of us, way a week back, while Nayan, Megha, Jaimin still running on the last day to get their things done. Nayan, the height of his laziness did the medical certificate even a day prior, while I got it done three weeks earlier. I was so happy turning on the Vacation responder for my office email. And I always liked to put them on whatever.LOL!! I reached Railway station with my family by 5 pm, while Megha, Shaily and Nayan already waiting.Shaily’s parents were also there. My Mom was happy to interact and find out there were more Parents on earth who allowed their kids to go on such trips. I saw some relief on my Mommy’s face. Soon Anuj and Jaimin reached, the train arrived and yippy here we go!! 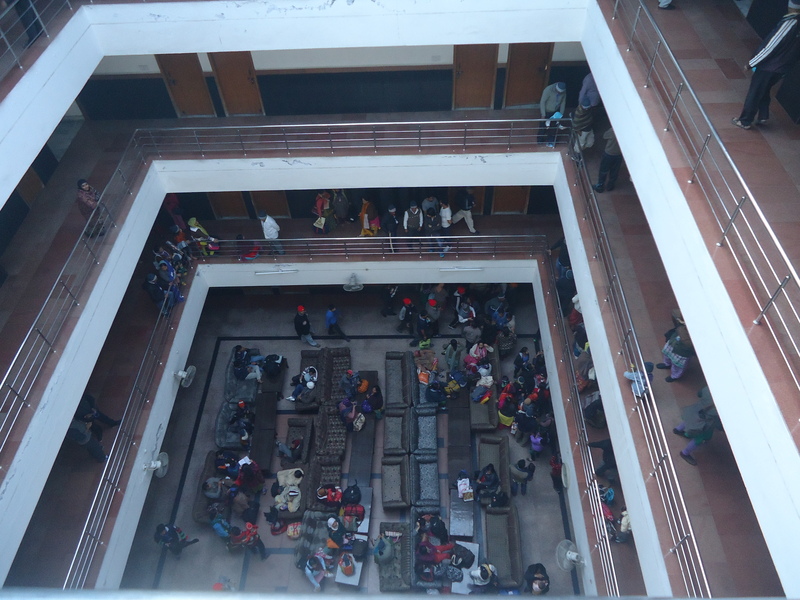 6th May,Chandigarh : It was a 22 hours train journey from Vadodara. 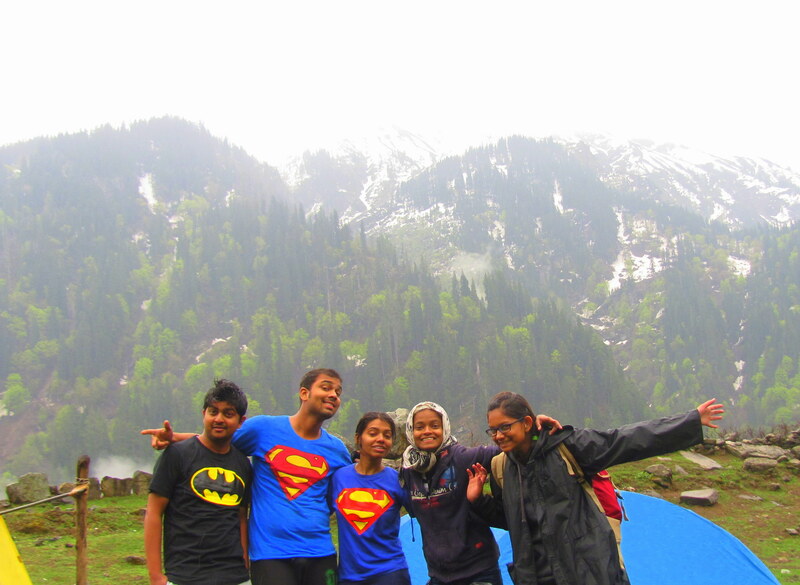 We reached by 4 PM the next day, 6th May and from there we had booked a 10 PM Volvo for Kullu. Since we have some good time before we took the bus, we decided to explore Chandigarh.We saw the Rock Garden, went to the Sukhna Lake, and finally reached Bus Station by 9:15 PM. At last we were in the bus, me and Shaily sat together, she told me about the earlier treks she did, Nayan snored, Megha sitting next to him awake all night while Jaimin and Anuj slept.We reached Kullu early as 6:00 am. It was cool, yes definitely, coming from that 44 degrees, crazy I went seeing the mountains, the rivers flowing everywhere, the tiny houses on the slopes. 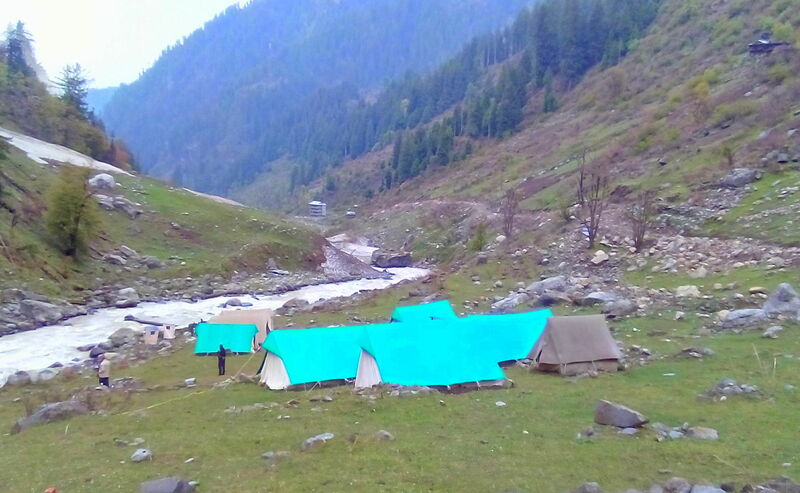 Our Base camp was at Seobagh some 3 kms from Kullu, so we took another local bus which dropped us just outside our Base Camp.As we reached the Base camp at around 7:00 am, we saw people lining up to sent off the Batch CP-09 which was leaving for higher camps that morning, we also joined in. The Tents! Home for next 10 days! We had to do the check in formalities and I had to search for the field Director to allow me to join the 7th May Batch. Such a kind and nice person he was, I got a nod to join this Batch. 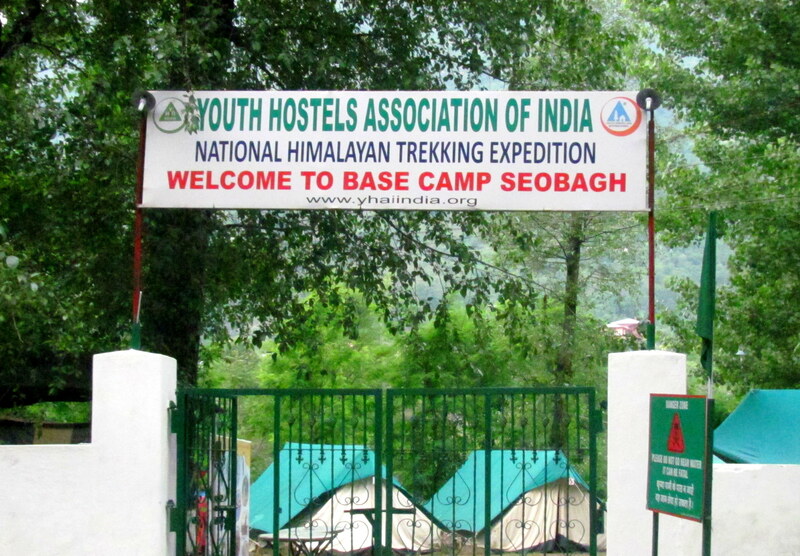 Seobagh Basecamp 7th to 9th May 2015: We were soon allotted our tents, and we hurried for the breakfast. The first three days at the basecamp is for settling and getting accustomed to the weather conditions there, morning exercises.Getting up early at 6:00 am was never a hard thing. The river Beas flew by just beside our Canteen area. The continuous noise of the flowing river actually became music to the ears. So much I missed that after returning. 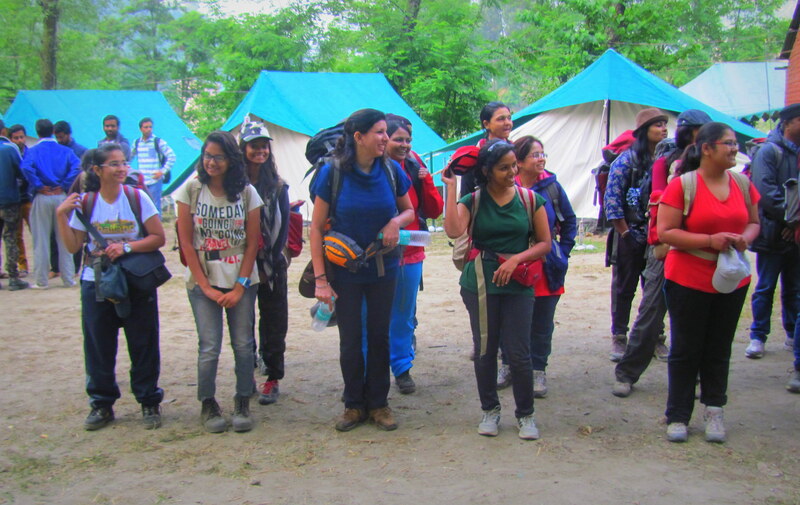 The Gals Gang at the Base camp…just about to leave for Yosgo Camp! 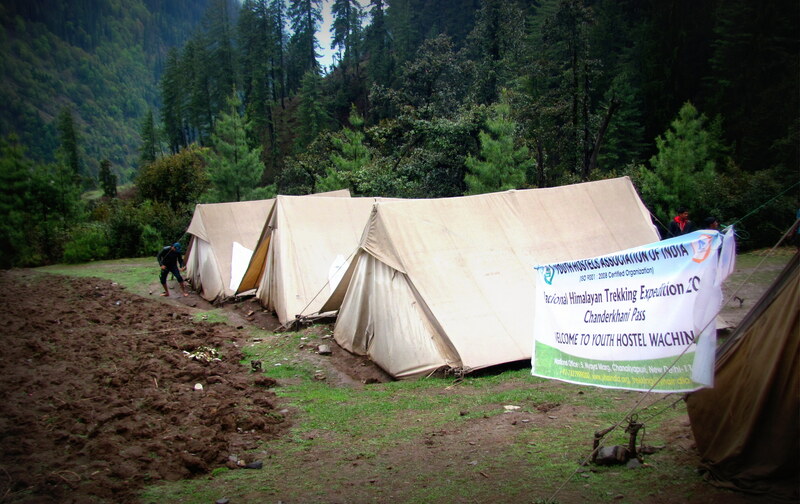 We left Basecamp by 8:15 am and reached the Malana hydro Project by 10:00 am. 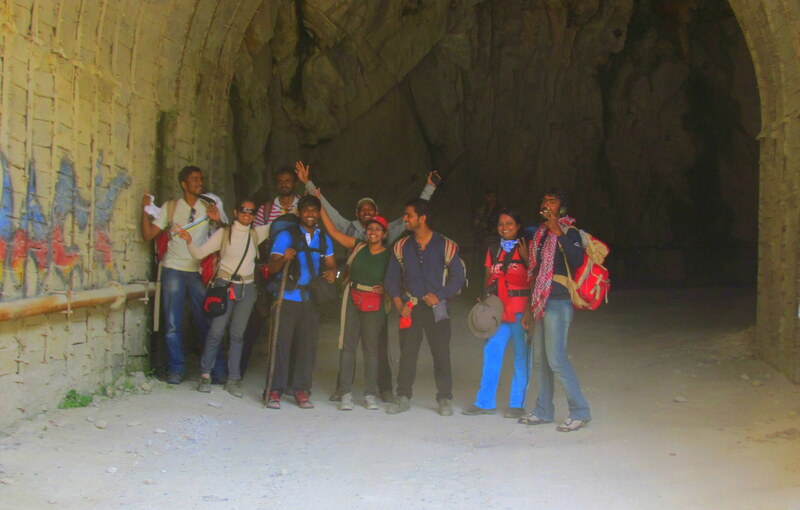 Everyone jammed in and our Himalayan Expedition on foot had actually begun.We soon reached a huge tunnel, a good photography point it was for us. We reached Yosgo camp way before time and they let us in only after 4:00 pm.This camp was more like in the forest’s den with the view of high rocky mountains all over.The best campfire we had was at here.Nayan almost had a singing ghost in him that night.Me and shaily hugged Nidhi, our Motu tight and sat all throughout the antakshari. It was an amazing time to sit in the mountains and sing without seeing anyone’s faces,as we had a torch ban. Around 9:30 PM ,when our camp leader had to ask us to pack up the antakshari ended finally. Next morning Mr Jagdish took us (the lucky ones who got up early) to show us the river flowing nearby.We had our breakfast, packed our bags by 8:00 am and soon bid goodbye to Yosgo. 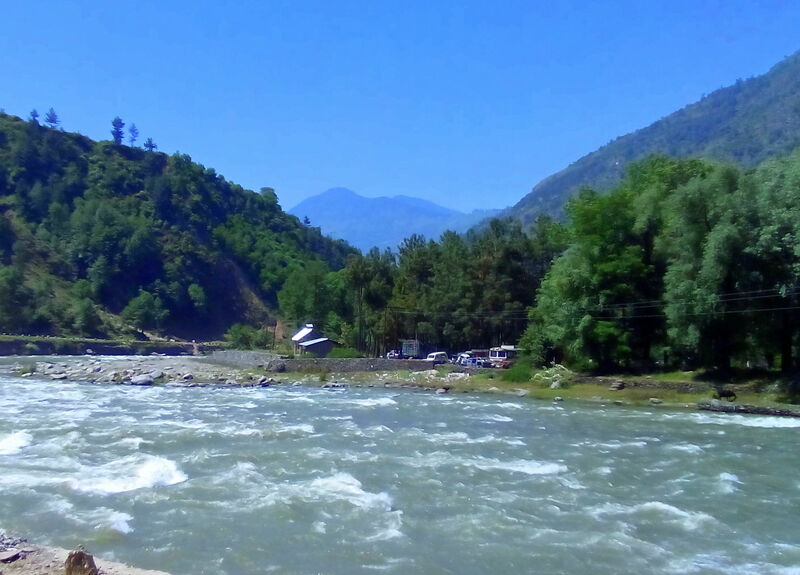 This was an exciting day for us as we were passing over the Malana village.Everyone who treks to Chanderkhani hears stories of this village.I have narrated by Malana experience in another post.Click here to read the Malana Post. Sometime after we crossed Malana where it was sunny, we had to pull the rainsheets as it started raining.We had a lunch point thereafter,got a half an hour break and moved further.From the lunch point it was a plain and easy walk for us, but a little boring one. We were pretty much on time to reach the Behali Camp.The experience of that first killing cold breeze we got was at this Camp, as there was a river flowing just near to our tents. Inspite of that cold,we had a Campfire in the night.The Baroda Gang did some Garba, followed by antakhshari. By 9 PM we packed up and got into our sleeping bags. This day it was birthday for Riya and Anniversary for Sneha & Prasanna. So Krupa planned a cake for them. 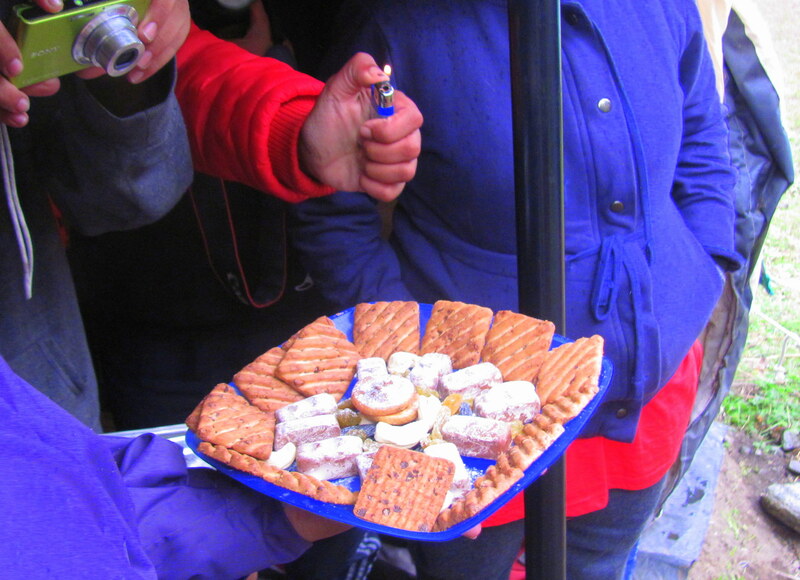 As as we had less options available with us, we used the Biscuits, chocalates, glucose etc.It was a good surprise for three of them. We were soon off to our destination, the Waching Camp. On the way to Waching! The rains continued to bless us.We reached a point when the rains got heavier and we had to take shelter in the Maggi tents.While our group got busy playing Dumb-charades, I preferred to warm myself sitting near to the fireplace.It was then I decided to check my messages and soon started receiving calls from family,friends; that is when I learnt about another earthquake hit Nepal that day, also effecting the north of India and other states.It was again a massive earthquake, richter scale 7.3 but we were safe and unafffected. Soon as rain slowed, we moved ahead and reached, the Waching Camp. Next morning again it was pack up time and we headed for Nagroni. This day was a little difficult than the previous ones as the trek was only scaling upwards.We went through some glaciers,some snow walk.I hardly remember clicking any pictures here,too tired on the 7th day of the trek and the unpredicted weather followed us everywhere. Slow and steady wins the race…. After a tiring day we reached Nagroni Camp.This happened to be the most beautiful camp.The beauty of the Himalayas was beyond words. The view from my Camp..a random Mobile Click!! All the 14 girls for the first time slept together in one tent here, it was fun, as before this we always had two tents.As soon as we had our soup, we saw hailstones, heavy rains followed,making our life difficult.The place was so muddy and slippery,left us no option but to stay inside our tents.When the rains slowed down a little we had our dinner at 6:30 pm.The hot gulab jamuns were such a bliss. A Selfie taken by Adarsh!! When everyone was inside the tents sleeping, some of us, the daredevils yes, opted to do some chitchat in that crazy weather.Soon we were inside our tents, no more fun and no campfire as next morning was going to be our epic day.We were supposed to get up at 2:00 am in the morning and start walking by 3:30. Soon it was rains, heavy snowfall, hailstones, cold winds. I only prayed that the weather turned out good for us, but in vain. It went worse.The walking trail was so narrow only one person could walk through it at one time. One slip and one would go down. I remember escaping such a slip. I wanted this horrifying morning to end as soon as possible. 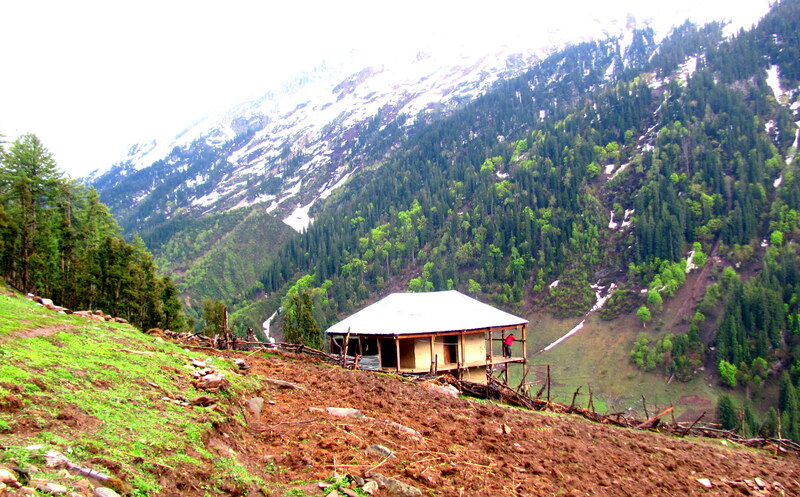 This was that part of the trek when no one stopped by, no fun, no gatherings, only continuous and endless walk. A 6 am Mobile Click while reaching the Pass! Mobile Click at the Pass! After 7 hours of challenging walk, by 10:30 am we reached the pass. I again could not take much pictures there as was completely drained off with no energy. But somehow managed to give my Camera to my little friend Samant who got some pictures of mine at the peak. The craziest thing was yet to come – the Slides. I could not imagine myself doing that and I did not want to do that.Just looking around and thinking about sliding down that snow made me faint.I could see the first slide point where some of them already reached and started queuing up.I had to do it. Me, Shaily and Pratima Mam had our first slide experience together, there were few more after this, but the first one was the craziest. Soon after the pass it was snowfall again. Now each one of us wanted to see the normal routes without snow. The sherpa’s were our Gods, who held our hands and helped us cross the pass.The guys of our group were awesome, who helped the ladies at each and every point. Some of my saviors who I whole-heartedly thank are Samant, Prasanna, Aniket, the Sherpas ofcourse. After all this we reached the Nauya Tapru Camp by 3:30 pm.I was among the slow walkers this time. That 12 hours of snowwalk gave me fever. The camp leader, Hitesh so nice of him, send my dinner in my Tent as I was not willing to go out and eat. I slept early that night. Next morning I woke up at 5:00 am and went out of my tent, did not want to miss the chance as this was our last morning in the mountains.I got company of Celian and Somesh,we chatted for some half an hour there. One could see the whole of Kullu from there, the lights of the city glew up like smalls stars.How pretty it looked! CP Bara – Bolo Tarara!! 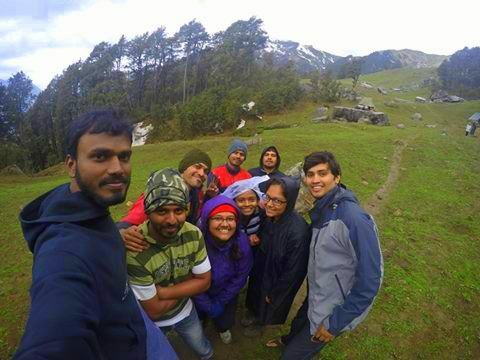 The Gang of 52 together at Nauya Tapru! Descending down and reaching the base camp was more fun. 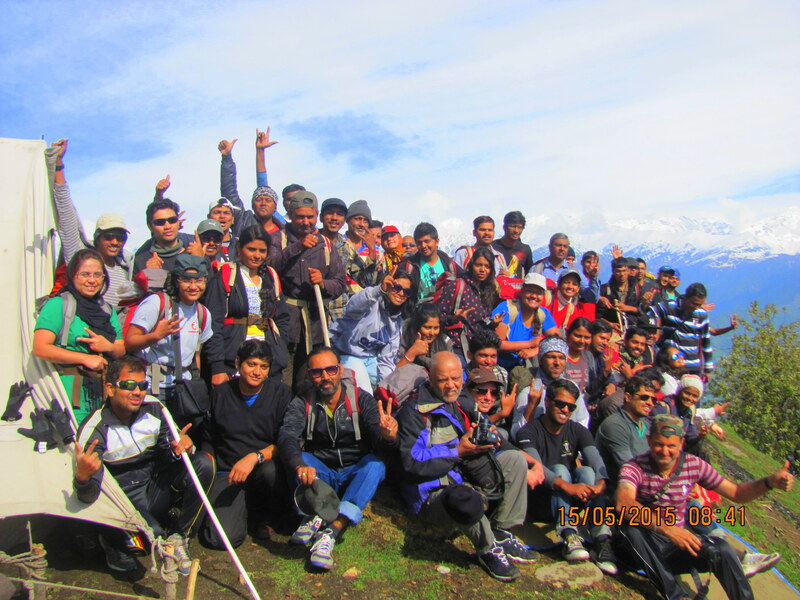 I alongwith Shaily, Anuj, Avinash reached the base camp by 4:00 pm while many others already reached and some followed us. The last day at the base camp went by so quickly.We completely ruled the Camp fire, many of us sharing their experiences. Next morning, I did not want to leave the base camp. 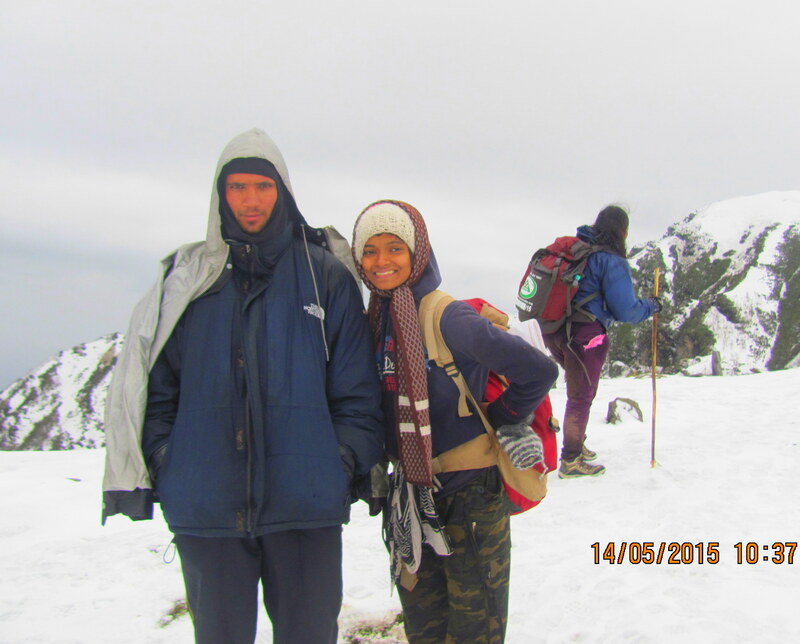 Inspite of the bad weather, the difficulties we faced, this was one of the best thing that ever happened to me. The memories are always going to be fresh in my mind. That 10 awesome days, 52 warriors (I proudly say that, 12190 ft, sharing almost everything from toothpaste to Lunchboxes, countless memories,the tents, the sleeping Bags, the rocks,rivers, mountains, the numerous falls in the snow,the shout out “Fire Fire Camp Fire”, the antakshari, that crazy endless walk in the snow, the hailstones, the rain, the snowstorm, days without bath, no make up, not bothering how you looked, what you wore, eating aloo (Potato) everyday, making friends, meeting new adventurers. I definitely want to do this again and again. Very nice memorabilia. I wish I too could contribute. Thanks for sharing. Glad you like my blog and decided to follow it. Years ago I got so sick in Katmandu that I never was able to see much before my scheduled plane to leave. Sad. 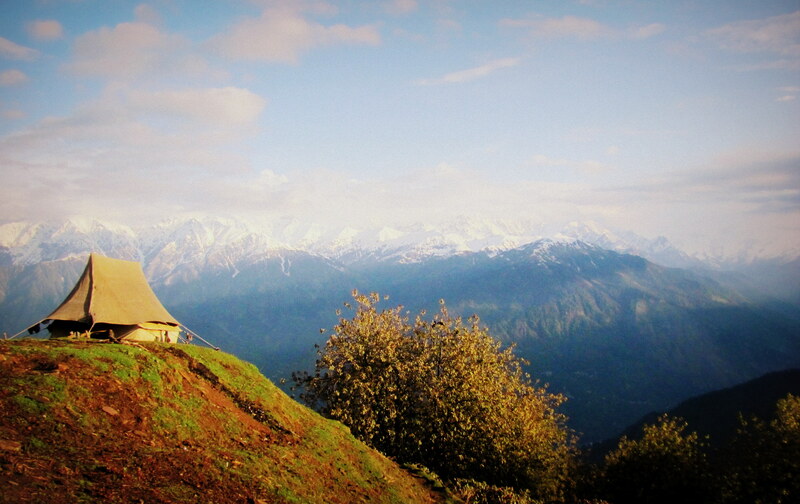 Try Kashmir–it is equally beautiful. Hi I am also from vadodara and booked for chanderkheni pass. I am also doing solo travelling. I wanted to ask you that how much time does it take to reach kullu from chandigarh ?